Sarenza is all about the classics.. Considering how much I love my high heels, and how much of a pain I find trying to get shoes to fit my size 8 (or sometimes 9) feet- or as I call them flippers, you would think I would have chosen a pair of 6” heels from Sarenza. My favourite shoes on the site have to be Converse All Stars in white. Purely for one simple reason- they are a classic shoe, which have stood the test of time. They’ve never gone out of fashion and you most definitely get your money’s worth out of them. Simples. They can easily be dressed up to give a going out dress an edgier rockier feel. And look equally as good dressed down. Why should Sarenza let me be their new shoe ambassador? I can prove that for those ladies who are blessed with feet on the larger size that they don't need to be self-conscious about their feet, and regardless of shoe size everyone can look fabulous in a pair of shoes. 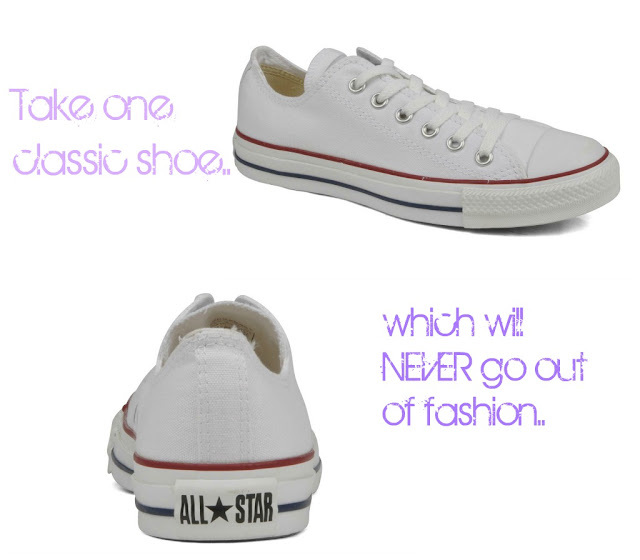 not really a trainer person... but I agree, allstars are lush!!! I loveeee my converses! I have blue ones but I'm dying for some black ones. I love that it's acceptable to wear them with a dress! Great post!